The UI&U Library contains a wide-variety of resources, including articles, e-books, newspapers, and streaming videos. Adding library resources to a course encourages students to use the library, prevents copyright concerns, and ensures students can obtain a copy of the readings assigned. Adding library resources to a course is easy. Simply let your students know that it’s available in the library and they can contact a librarian if they need any assistance. You can also create a link using the OneSearch Permalink Tool. To create a permalink: 1) locate the item in OneSearch, 2) click the title, 3) click the permalink icon, and 4) copy the permalink into your syllabus (never use the link in the browser address bar). Review your course links each term. Let the library know what e-books you are using in your course. Whenever possible, the library will purchase “individual insurance copies” to ensure uninterrupted access in case an e-book is ever removed from a subscription database. Be aware that the URL displayed may be directing students to a different URL. This is a problem because links copied from the web version of Outlook into MS Word are sometimes reformatted with an Outlook redirect prefix. 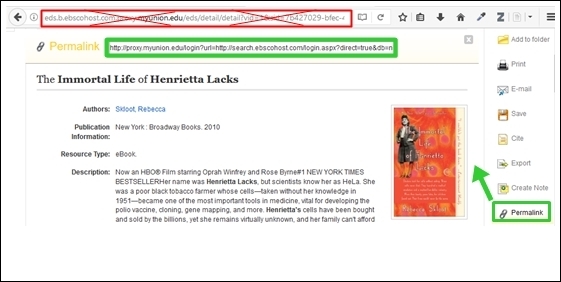 Link problems can be prevented by removing direct links and encouraging students to find resources in the library using OneSearch.